« What Chemicals Are in My Bedding? Both of these verses are about the mythical Sandman of folklore in Northern Europe. The imaginary Sandman caused people to sleep, then sprinkled magical sand on them to bring good dreams. 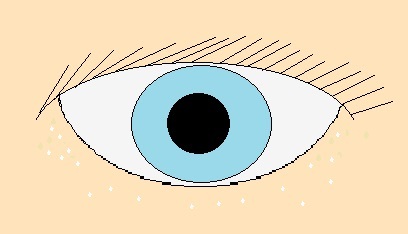 The “sand” in the stories refers to grainy particles most people have in and around their eyes after sleeping. It does feel like sand. Real sand, the kind we find in the ground and on the beach, is made of silica, one of the more common compounds on Earth. Chemically, it is silicon dioxide, SiO2, one atom of silicon and two of oxygen. One tenth of the earth’s crust is silica. It is very stable, and can appear and be used in several forms: sand, quartz, gemstones, glass and crystal, gels, silicone, and integrated circuits. Small impurities can change its properties in many useful ways. Silica is not toxic. It can be swallowed harmlessly. But silica dust can be hazardous to breathe, since it is an irritant and can clog air passages, and getting this dust (real sand) in our eyes can be harmful by scratching the cornea. If the sand in our eyes is not real sand, then what does silica have to do with sleep? The role of silica in sleep may begin even before we sleep on our mattresses. Moisture control is very important to sleep. Not only for comfort, but for freshness. Dampness can corrode metal springs. It can degrade foams. It can promote the growth of mold, bacteria and other undesirable micro-organisms. When a mattress is sealed in plastic, existing moisture is trapped inside. One way to control moisture is with dessicants. Dessicants absorb and keep moisture from the air. They are often put into packaging with various items for this purpose. That’s what’s in the packets in boxs or bags that are delivered or brought home from the store. What is in the packets is usually silica gel. According to Wikipedia, “Silica gel is a granular, vitreous, porous form of silicon dioxide made synthetically from sodium silicate.”² Let’s unpack that. “Granular” means that is in the form of grains or beads. “Vitreous” means glassy. We all know what “porous” means. Beads of silica gel have very small holes, nano-pores, all the way through. They attract and hold molecules of water. This means that there is a limit to how much moisture the beads can remove. To use silica dessicants for a long period of time, they have to be periodically recharged with high temperatures to drive out the water. This limits their role with a mattress to storage and delivery. However, room dessicants which can be recharged or refilled are often used to contol moisture in a bedroom for more comfortable and healthful sleep. Federal flammability standards set by the Consumer Products Safety Commission require mattress manufacturers to protect mattresses from flashover, engulfing the room in flame. Since the chemicals used to make foam flame-proof are banned because they are toxic, the best way is to wrap foams in something to protect them, a fire sock. Manufacturers have tried to find affordable non-toxic or least toxic means of doing this. One way is to infuse rayon with silica. Rayon is reconstituted cellulose extracted from wood. Rayon is normally flammable. But when silica is included in the extruded rayon fibers, it changes the burn properties. If fabric made of silica rayon (one brand name is Visil) burns, it forms a protective shield, cutting off oxygen from the foam. Some persons fear that silica on the rayon will escape as powder and be breathed in by the sleepers. Since the silica is actually part of the rayon, there is little chance of that, unless the thread is seriously worn down, which is not likely since it is beneath the quilting. A growing involvement of silica in our sleep is in electronics. If we have a waterbed, airbed, or adjustable bed, we have remote controls. These control the temperature in the waterbed, the pressure in the air bed, and positions in the adjustable bed. Whether wireless or wired, remotes have intergrated circuits. An intergrated circuit is a whole electronic circuit on a thin slice of silicon with a layer of silica. Adding other ingredients in prescribed places in the silica defines the circuit. This has now become more than controlling the temperature, pressure and position of our bed. Many adjustable beds have a massage function. Remotes can also control night lights, room lights, fans, audio systems, window blinds, you name it. We even have smart beds. Beginning with remembering our favorite settings, silica chips monitor our temperature, heart beat, blood pressure and breathing. Coördinating this data with settings of the bed, they calculate how we sleep best and adjust the bed accordingly. Some beds can even connect with monitoring devices we take with us to see how our sleep affects daily activities. It seems like the Sandman does not sleep when we are awake! Many current adjustable bed models have AC and USB outlets for our electric and eletronic devices. And they can connect by Bluetooth to our smart phones, tablets and laptops. About the sand in our eyes. If it is not silica, then what is it? It is dried beads of fluids from our eyes. Our eyelids constantly squeegee our eyeballs when we’re awake to keep them moist and clear. But when we are asleep, the fluids just sit there. Water in the fluids evaporates leaving behind beads of dissolved substances. ¹”Mr. Sandman”, written by Pat Ballard, recorded by the Chordettes, © 1954. ²Wikipedia, “Silica Gel”, https://en.wikipedia.org/wiki/Silica_gel, accessed 6/15/2016. This entry was posted on Thursday, June 16th, 2016 at 11:48 AM and is filed under adjustable beds, airbeds, beds, chemicals, coils, cover, fabrics, foam, furniture, health, massage, materials, mattresses, padding, rayon, waterbeds . You can follow any responses to this entry through the RSS 2.0 feed. You can leave a response, or trackback from your own site.